"A powerful first novel about poaching in Africa and a woman determined to stop it"
Catherine Sohon with the Wildlife Investigation Agency picks up a third flat tyre driving on a bush road through Namibia, so on foot, with a revolver just in case, she continues towards a ranger station. Then she comes across a crashed car with dead people inside - they've been shot. The trunk of the car holds a clue, a chip of ivory. Poachers and smugglers abound in this brutal trade. The IVORY GHOSTS mean Catherine is now also at risk. Catherine, with a PhD in biology and a remarried father in San Francisco, had a fianc� in South Africa, Sean, who was killed. She took a step aside from just counting and observing elephants when she learned that a hundred of these creatures were being shot every day. Now a pilot, she tracks the poachers and ivory traders. With poor wages, some of them may be local villagers or rangers, so she can trust nobody and keeps her mission secret. The atmosphere is immediate and total as we hear various creatures in the bush and see the setting sun making dark silhouettes of an elephant herd. Car seats are too hot to sit on, while women carry firewood bundles on their heads and boys drive oxen sleds. I thought Catherine seems really capable but not foolhardy. Her new boss tells her that Africa is a land of broken dreams, and his staff can't be bothered filling out the complex paperwork to process the DNA from different tusks. International borders only exist on maps, and from the air Catherine sees elephants wandering across to escape forest fires. I liked that despite, or because of the remote location, Catherine uses up to date gadgets like a satellite phone, low-light binoculars and night-vision digital camera. However, gossip is still her best way of gathering information, especially since the village women won't talk to men. Witchdoctors, self-interested headmen and Chinese traders provide plenty of suspects - and that's before we wonder what the foreign aid workers might be adding as extra-curricular activities. IVORY GHOSTS is not a book for the tender, with animal shootings and human murders, but it provides an excellent amount of insight into trade of endangered species. Author Caitlin O'Connell has been living in Namibia with her husband since 1991, and has written five non-fiction books about elephants and how local people try to co-exist with them. IVORY GHOSTS is her first fiction work of fiction, a way of reaching a different audience with her message about the plight of elephants in Africa. If you have enjoyed Nevada Barr's books about the National Park Rangers in America, or if you are interested in taking a safari, IVORY GHOSTS will be a must- read. The tension is immediate and never lets up, while the wildlife steps into the room and breathes over your shoulder. 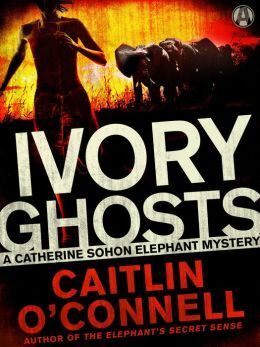 IVORY GHOSTS by Caitlin O'Connell is a powerful first novel with an even stronger impact for being fiction lightly overlaid on fact. In a blockbuster debut thriller brimming with majestic wildlife, village politics, and international intrigue, a chilling quadruple homicide raises the stakes in the battle to save Africa�s elephants. Still grieving over the tragic death of her fianc�, American wildlife biologist Catherine Sohon leaves South Africa and drives to a remote outpost in northeast Namibia, where she plans to face off against the shadowy forces of corruption and relentless human greed in the fight against elephant poaching. Undercover as a census pilot tracking the local elephant population, she�ll really be collecting evidence on the ruthless ivory traffickers. But before she even reaches her destination, Catherine stumbles onto a scene of horrifying carnage: three people shot dead in their car, and a fourth nearby�with his brain removed. The slaughter appears to be the handiwork of a Zambian smuggler known as �the witchdoctor,� a figure reviled by activists and poachers alike. Forced to play nice with local officials, Catherine finds herself drawn to the prickly but charismatic Jon Baggs, head of the Ministry of Conservation, whose blustery exterior belies his deep investment in the poaching wars. Torn between her developing feelings and her unofficial investigation, she takes to the air, only to be grounded by a vicious turf war between competing factions of a black-market operation that reaches far beyond the borders of Africa. With the mortality rate�both human and animal�skyrocketing, Catherine races to intercept a valuable shipment. Now she�s flying blind, and a cunning killer is on the move.